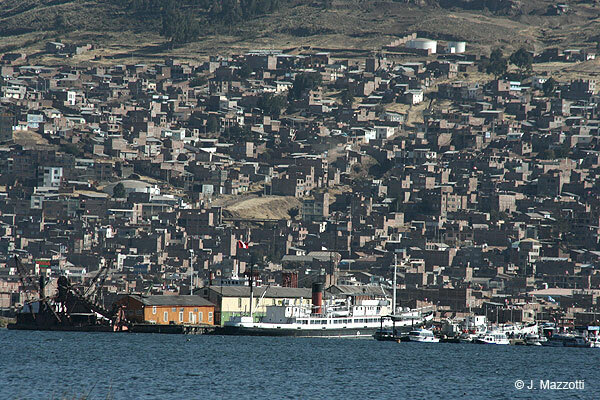 Puno city, capital of department of Puno, is located at South Andean zone of Peru, plateau, 12,555 feet / 3,827 meters above sea level, facing to Lake Titicaca. Some colonial churches, large-houses, modest museums, lookout and natural viewpoints on the top hill. In front to the main square stands the Cathedral, a magnificent building baroque style of the seventeenth century. In Jirón Lima, a pedestrian street, featuring the restaurants, bars and handicraft shops. Major hotels are located at downtown and the higher category lakeshore with breathtaking views. It is the starting point to visit Lake Titicaca and its islands. The native resident of Puno is of the ethnos Aymara (12.9% population of Peru); their language is the Aymara. For the subsistence in height average of 4,000 meters above sea level (13,122 feet) and with a cold climate, they have achieved an excellent adaptation; its inhabitants are proud of their Quechua and Aymara past, and their folkloric tradition that can be seen every year in the form of dances and rituals during the Festivity of Virgen de la Candelaria. Puno is a legend, a multicolored festival, and is the folkloric capital of Peru by the wealth of its artistic and cultural expressions. Built in the 17th century, its façade was carved by the Peruvian master builder Simón de Asto. The church is an example of the Spanish Baroque style, but also features Andean elements, giving the monument its mestizo character. 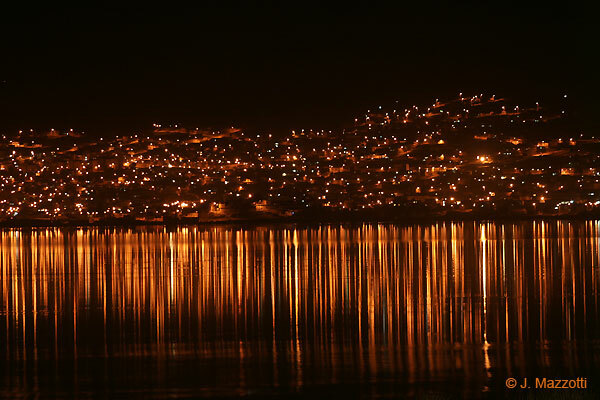 Is located in Puno downtown, in front of Parque Pino. Was a chapel 200 years ago and rebuilt as church in 1876. 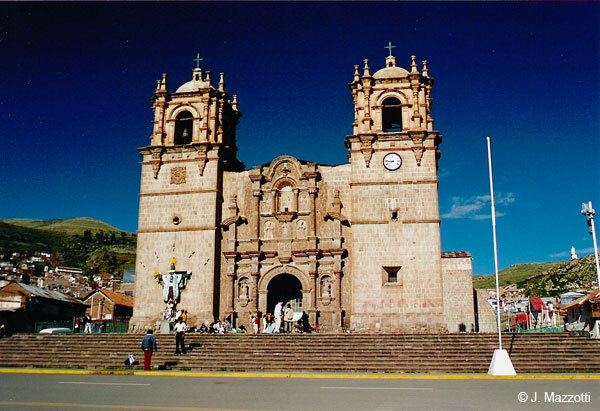 Is the sanctuary of Our Lady of Candlemas (Virgen de la Candelaria) patron of Puno city. Built in approximately 1668, this is the house where the Viceroy Conde de Lemos stayed when he arrived in the area to suppress a rebellion. The Puno Regional Cultural Department is currently based here, and it also holds the “Francisco Montoya Riquelme” art gallery. Visiting Hours : Mon - Fri 8.30 am - 12.30 p.m. and 2.00 p.m. - 5.30 p.m. Free admission. Location : Crossroads of Deustua and Conde de Lemos streets. A colonial building from the 17th century, which today holds the centre for Fair Trade (CIAP), in which handicraft items are displayed and sold. The site has a café bar, cultural activities are held there, and visitors can find information about rural and experience-based tourism. Visiting Hours: Monday - Saturday: 8.00 am - 7.00 p.m. Free admission. Location: Jr. Deustua Nº 576. 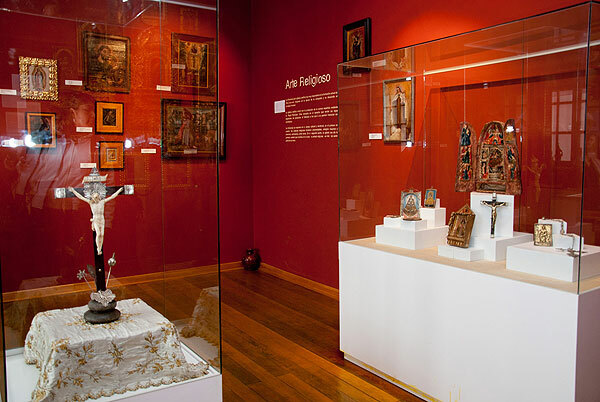 The museum exhibits pottery, gold and silver objects, textiles and sculptures from the Inca and pre-Inca cultures, including items from the colonial and Republic eras. 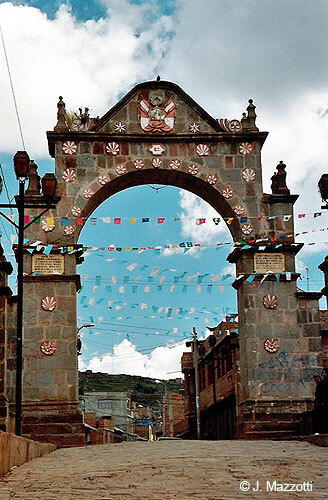 It has a coin collection and documents relating to the Spanish foundation of the city of Puno. The museum has 8 rooms: Inca Room, Lithic Gallery, Regional Archaeology Hall, Sillustani Treasury Exhibition, Art Gallery, Colonial Room, Religious Art Room and the Dreyer Inca Room. Visiting Hours : Monday - Saturday 9.00 am - 7.00 p.m. Location: Conde de Lemos Nº 289. Built in stone carved by the Puno people in memory of the patriots who fought for Peruvian independence. Visiting Hours : Monday - Sunday: 10.00 am - 5.00 p.m. Free admission. Location : Jr. Independencia block 2. The site presents the history of the coca leaf in Peru from ancient times to the present day, as well as examples of traditional folkloric clothes from the high Andean plains, which tell the story of their different origins. Products made from coca are available, including biscuits, sweets, piscos, wines, mate (a herbal infusion) and chocolates. Visiting Hours: Monday - Saturday 9.00 am - 8.00 p.m. Sun 4.00 p.m. - 8.00 p.m. Location: Deza Nº 301. Iron-hulled ship built in Great Britain in the 1860s and transported from the Pacific coast to the Andean highlands in 2766 pieces. Inside, visitors can see many objects in different rooms of the boat, including documents, archives, historical maps and models from that era. This is the extraordinary story of the motor-ship Yavari - 1862, in the navigable but highest lake of the world, the Titicaca. In 1861, the Peruvian Government of Ramon Castilla, ordered two small cargo-passenger "gunboats" for Lake Titicaca. Already enjoying the wealth from the guano industry on the coast, the Government looked to exploit the natural resources of the southern highlands or altiplano region around Lake Titicaca. Here lay the potential for trading Peruvian copper, silver, minerals and wool and timber and riches of the rainforest from Bolivia with manufactured goods from Europe. Through the agency of Anthony Gibbs & Sons, the Government commissioned the James Watt Foundry in Birmingham, England (where steam was first harnessed for industrial use) to build the ships that would collect goods from around the lake. Without a rail link to the lake at that time, all cargo had to be carried up on mule back. Therefore, the ships were built in kit form, with no piece weighing more than 3 ½ cwts, the maximum carrying capacity of a mule. On 15th October 1862, the "Mayola", bearing the two ships and eight British engineers from London, having rounded the Cape Horn, docked at Arica - a Peruvian port before the War of the Pacific - and discharged the packing cases and pieces of the Yavari and the Yapura, from where moved by train to Tacna, before incredibly being hauled by mule over the Andes to Puno, that took 6 years to complete. The Peruvian Navy then faced the daunting task of getting 2,766 pieces and two crankshafts transported to Lake Titicaca, 12,500 ft. (3,810ms) above sea level. 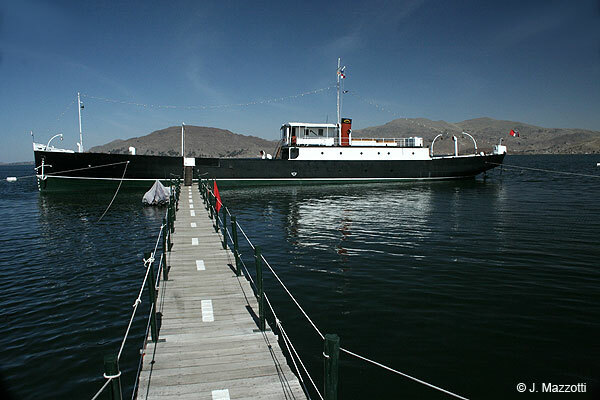 The Yavari, as a State Registered Museum, is now berthed in Puno Bay, outside the Sonesta Posadas del Inca Puno. A 40 m. pontoon gives access to the vessel either by land or by boat, and visitors are warmly welcomed. Visitig Hours: Monday - Sunday: 8.00 am - 5.15 p.m. No entrance fee - voluntary contribution. Location: Av. Sesquicentenario 610, Sector Huaje (Jetty belonging to the Hotel Sonesta Posadas del Inca Puno). Natural viewpoint from which visitors can see the city and Lake Titicaca. On the top of the cliff, one can see a monument to Manco Cápac, founder of the Inca Empire. It is said that there are caverns in the hills through which underground tunnels link Puno with the Korichanca temple in Cusco. Visiting Hours : Monday - Sunday: 10.00 am - 5.00 p.m. Free admission Location: 4 blocks from the Plaza de Armas, towards the west of the city. Kuntur Wasi or "Condor House". The site, which offers an unbeatable view of Puno city and Lake Titicaca, can be reached by climbing a long series of steps. Visting Hours: Mon - Sun: 9.00 am - 5.00 p.m. Free admission. Location: 2 Km from the centre of Puno city (15 minutes by car). A real highlight is the stone monument of a puma (a symbol of the viewpoint as the puma is a watchful animal that protects the Andes). It sits on a fountain that represents Lake Titicaca. The site has many recreational areas. Visiting Hours: Mon - Sun: 9.00 am - 5.00 p.m. Free admission. Location: 3 Km north-west of Puno (20 minutes by car).